Who’s winning Daddy? (The Red Sox are winning.) 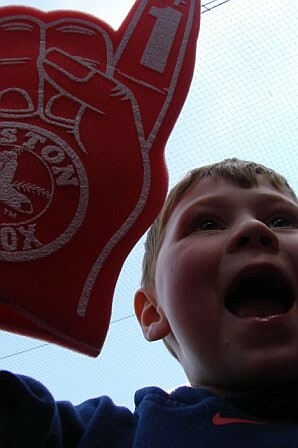 Yay, the Red Sox are winning! What’s the score? (Six to nothing.) Is this normal? (No, this is really good.) I mean, are they major leaguers? (Yes.) This is stupid. (Why?) I thought that major leaguers were supposed to be good. (They are, but our pitcher, Clay Buchholz, is pitching so well, the Rangers can’t get very many hits.) Oh. Is it almost nighttime? (No, it’s 1:20pm.) Is the game almost over? (Well, we’re in the fifth inning and the whole game lasts nine innings.) So there are four innings left? (That’s right.) Will it be nighttime when the game is over? (No, there’s a lot of daytime left.) Good, ’cause there’s a show I really want to watch on TV tonight. (What show is that?) I forget the name. Is a trillion more than a billion? (Yes.) How many trucks would you need to carry a trillion dollars? (Um, a hundred.) No, you’d just need one, because you could have one bill with a trillion on it. Daddy, I made up a number. (Really? What is it?) A killion. And it’s so big, the dollar bill would be as long as Fenway Park. It’s as big as a trillion billion dollars. 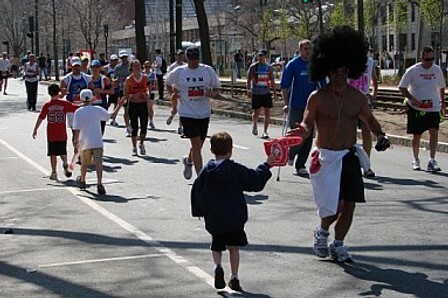 (We were on the sidelines of the marathon and I had cheered for many runners by reading the names on their shirts. My six year-old was incredulous.) Daddy, how do you know all these people? P atriots’ Day was established as a Massachusetts (and Maine) civic holiday to commemorate and celebrate the Battles of Lexington and Concord, the first battles of the American Revolutionary War. 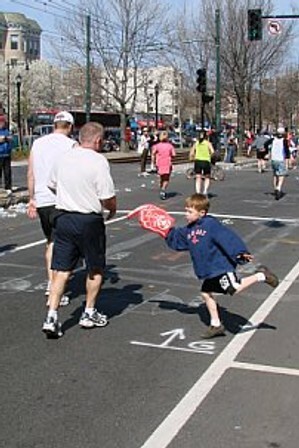 And in Boston, we know how to celebrate our history in style — a Red Sox game at Fenway for breakfast (11:05am start time), and the world’s coolest foot race (Boston Marathon) for lunch. Today, I was lucky enough to attend the game with two of my children (9 and 6) and their friend (9), enjoying a rare Monday day game while kids in other states across the country were busy toiling away in school. 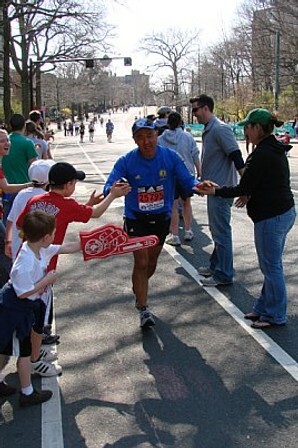 And after Delcarmen nailed down the final out, we walked three miles from Fenway to Cleveland Circle, cheering on those runners at the back of the pack, the ones who needed our wild cheers the most. At 9:00am, my boys and I picked up a friend and posed for our first photo of the day. Daddy needed a cup of coffee, so a quick stop at Dunkin’ Donuts was required. The Papelbon poster got us into the mood for the day. 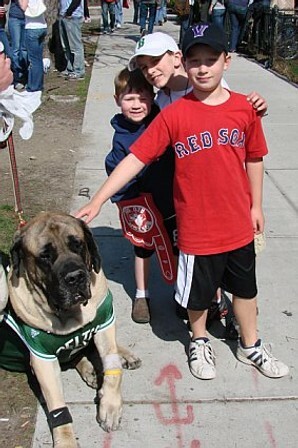 We parked the car at a friend’s house near Cleveland Circle, and the small plot of green grass in the front yard meant that forward progress towards Fenway would have to wait for a few minutes…. boys will be boys. 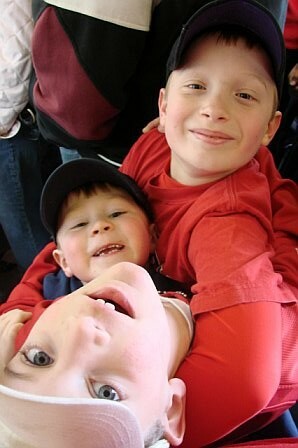 … and we squeezed close together on the train to make room for Sox fans getting on at subsequent stops. 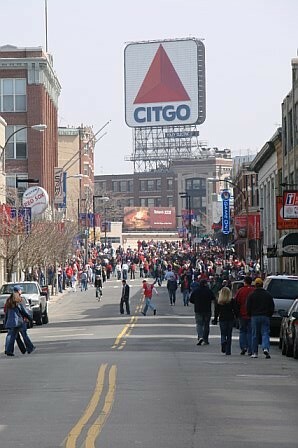 The walk from the Fenway T-stop to Yawkey Way is one of the great walks in North America. 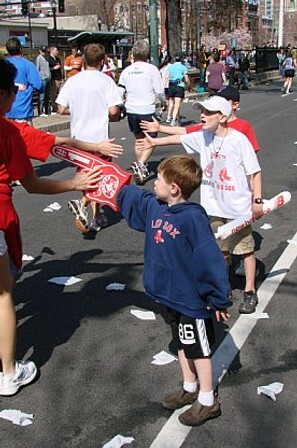 The goosebumps get huge when you get to Brookline Avenue and see the crowd outside Fenway. 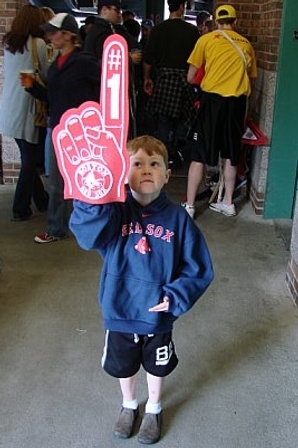 This was my six year-old’s first game at Fenway (since he was too young to remember anything), so I taught him to hold his hand over his heart during the National Anthem. He sang at the top of his lungs. 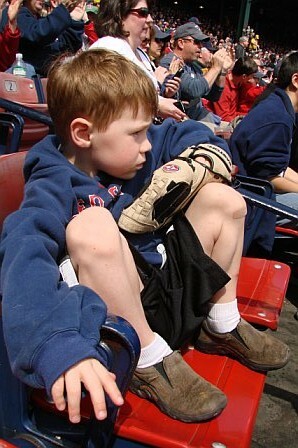 After two innings, my six year-old started getting restless. Hot dogs and pizza helped a little. 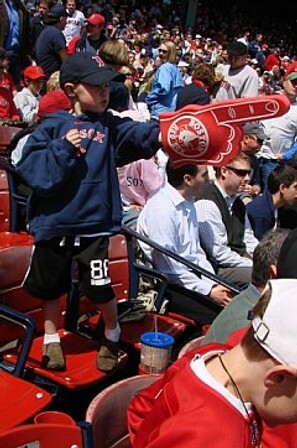 But what he really wanted (and needed, it turned out) was a Red Sox #1 foam finger! 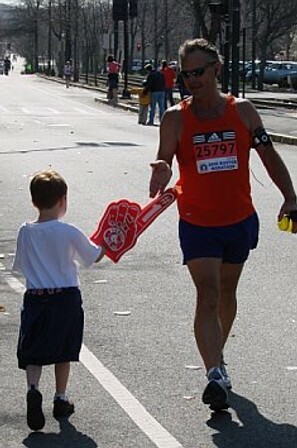 Let us not underestimate the power of the foam finger! To a six year-old, it can provide hours of companionship, entertainment, and enjoyment! Then, in the fifth inning, it was time for…. the blankie! 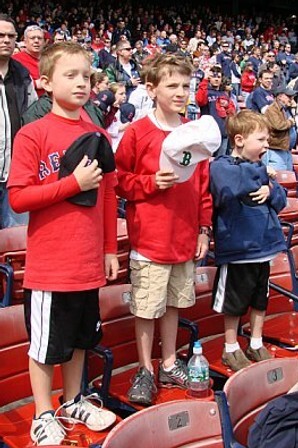 By the 8th inning, many of the seats had been vacated, so the boys headed down to the very front, where they sang “Sweet Caroline” and cheered the Sox to a sweep of the Rangers. 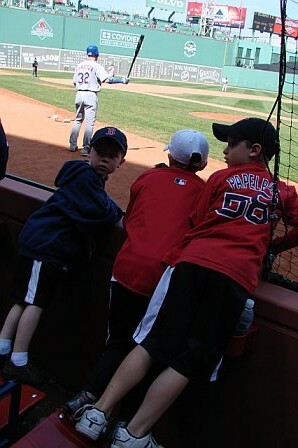 And I honestly can’t remember the last time I saw a player signing autographs at Fenway Park…. 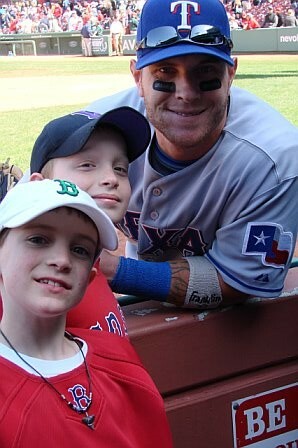 but after the game, Josh Hamilton of the Rangers signed for one and all… and made it an extra-special day for a lot of kids. 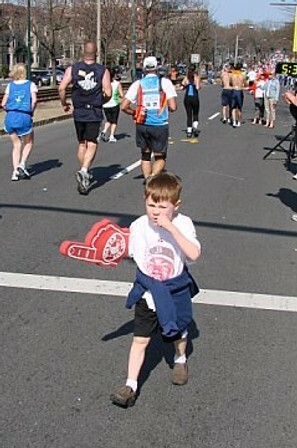 Then, it was time to head out to Beacon Street to cheer on the marathoners! 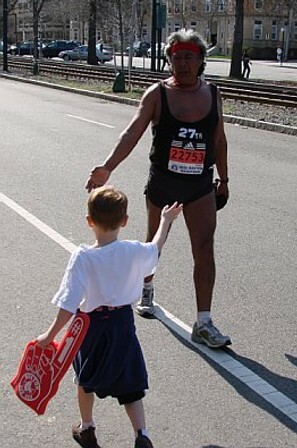 A Monday without school, a day spent with family and friends, four hours at Fenway Park on a sunny day, a Red Sox win, the opportunity to high-five courageous runners as they near the finish line of a long, grueling race, and memories to last the rest of the year and longer. What’s better than that? The Yankees of 2008 are a different lot –- they have become the Red Sox of pre-2004! What better evidence is there that the Red Sox are “in the heads” of the Yankees than the fact that the Yankees’ front office went to the trouble and expense to unearth the Red Sox jersey, and that they made such a public spectacle of the whole issue. Like Hank Steinbrenner’s pathetic, naive denial of the existence and magnitude of Red Sox Nation in March, this is just another clear sign that the Yankees are frustrated and demoralized, forced by the Red Sox’ superiority to worry about curses and jinxes and garbage like that. A proud Yankees franchise wouldn’t have roared at such a clever, funny stunt. 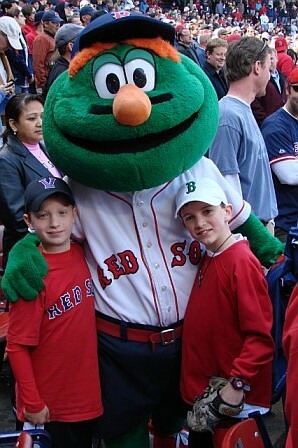 If the Red Sox fall to the #2 spot behind the Yankees in the rivalry again (perhaps about 86 years from now?) we need to take a cue from these misguided Yankees executives and remember not to act so obviously and obsessively inferior. The rivalry is back, with the Yanks taking the first of their 18 regular season meetings this year. 17 more games before October? That’s the equivalent of an entire New England Patriots season. Almost an overdose. And with the rivalry stoked by that construction worker who buried a Red Sox t-shirt in the foundation of the “new” Yankee Stadium, we’re all assured another century of emotionally charged competition. 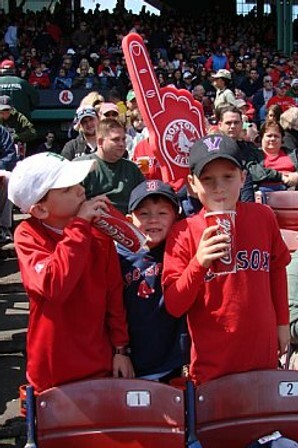 Would you say that “the rivalry” is the best aspect of being a Red Sox fan? I would. “No problem,” said God as he cracked a knowing smile. To read the entire guest post at Sox and Pinstripes, click here. 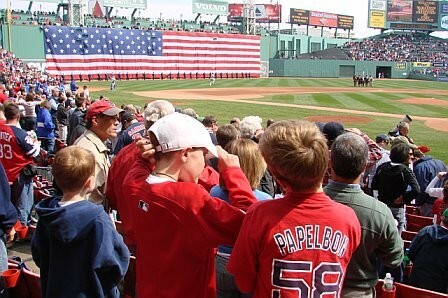 There are hundreds of songs about Christmas, but I can’t think of one song about the best holiday of the year: Opening Day. So this past weekend, with the excitement of the home opener building, I sat down and wrote a song about Opening Day (lyrics below). On Sunday night, after my kids were all in bed, I recorded it in my basement onto my Mac laptop using GarageBand software. Five tracks: two acoustic guitars and three vocals. Click on the box (right) to listen. Enjoy! 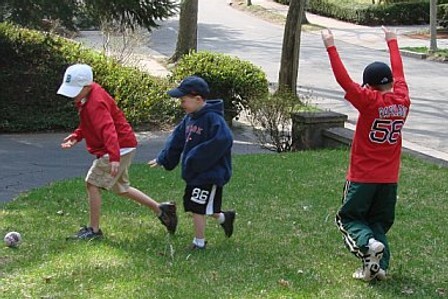 I started playing online fantasy baseball in about 1995 or so, and it’s now an annual tradition. Draft day has become a holiday on my calendar and is as eagerly anticipated as any day of the year. 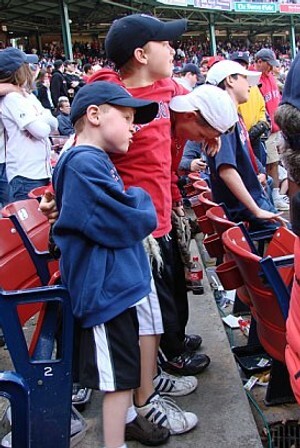 This year’s draft — my son’s first — will go down in history as my favorite of all-time, for it demonstrated the emotional hold that our beloved Red Sox players have over us, especially when we’re kids. The last two years, my almost-nine year-old son has “co-managed” my fantasy baseball team with me (I’m in a 12-team Yahoo! league with my brothers, sister, father, and several close friends). The main impact of his co-management has been the reliable presence of Nomar Garciaparra on the roster and also in the starting lineup whenever he has been healthy. 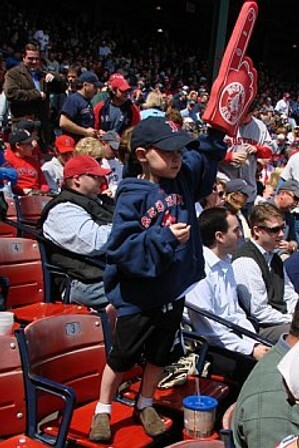 (“Daddy, put Nomar back in the lineup!”) Although my son was only five years old when Nomar was traded, #5 remains a god in our house. This past fall, my son managed his own fantasy football team against his dad, uncles, aunts, and grandparents and WON the league. He established himself as a draft wizard, grabbing Peyton Manning, Randy Moss, and Adrian Peterson with his top three picks. So, riding a wave of pride and optimism, in February he asked to manage his own fantasy baseball team. 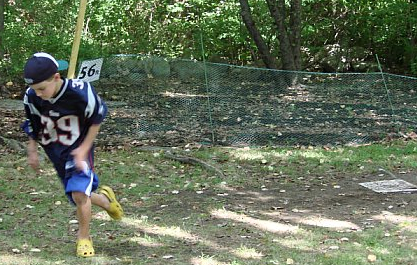 Confident that he was ready to compete with the big boys, we expanded the league to 13 teams. The Draft: Peavy or Beckett? Sizemore or Ramirez? A few minutes later, the draft order was revealed on our Yahoo! draft site. My son had pick #3, and I had pick #4. 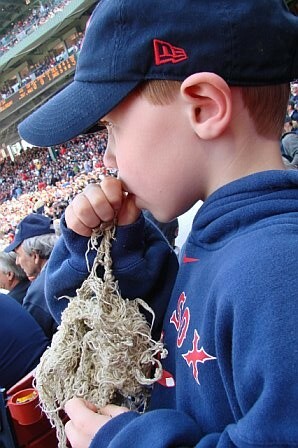 “I really hope Peavy will still be there at number three!” he prayed. I set up shop at my laptop in a room adjacent to his cockpit. At 7:30pm sharp, the draft went live. Suddenly, A-Rod was gone. “Yes! He took A-Rod!” The second pick was… Jose Reyes. And the clock started ticking on my son’s pick, number three. He had 90 seconds to click on Jake Peavy. But he froze. Pick Peavy, I urged. “I don’t know, Daddy,” he said, struggling with a decision. 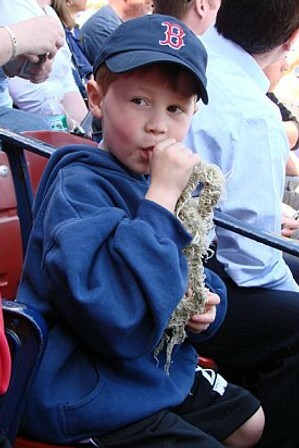 “Maybe I want Josh Beckett.” Peavy’s a great pick, Beckett’s a great pick, I told him. 20 seconds left. Make your pick! 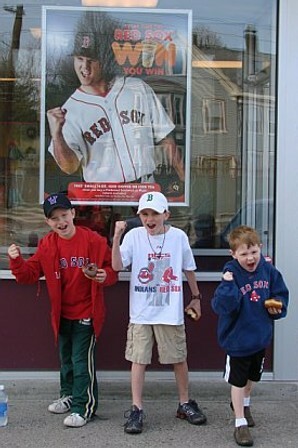 “I want Josh Beckett.” Click. Emotion trounced Analysis. How great is that?? Fast forward to the second round. My son had spent the rest of the first round studying his notes to figure out who to take next. 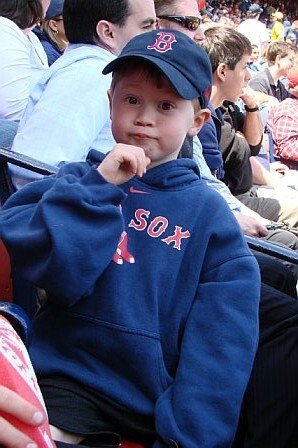 “If he’s still available, I’m going to take Grady Sizemore with my second pick,” my son announced. Good choice, I assured him. Then came his turn to draft. And he froze. Pick Sizemore, I urged. “Daddy, do you think I should take Grady Sizemore or Manny Ramirez?” he asked. You’ll be able to get Manny in the next round, I assured him. Go for Sizemore this round. “Don’t tell me what to do!” he said curtly. And suddenly, Ramirez was Beckett’s fantasy teammate. Let’s jump to the third round. “I think I’m going to take Jonathan Papelbon,” he said. “Do you think that’s a good pick, Daddy?” He’s a great player, I told him, but no one’s going to pick a closer until the fifth round at the earliest. You can get him in a later round. “Don’t tell me what to do!” Click. Papelbon joined his Red Sox teammates on a roster that was looking more and more like a tribute to the posters on my son’s walls. Fourth round — analysis had been totally abandoned and emotion had taken over. 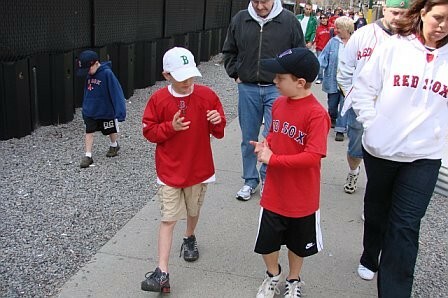 He wanted to pick Dustin Pedroia but I convinced him that Mike Lowell would be a better pick. 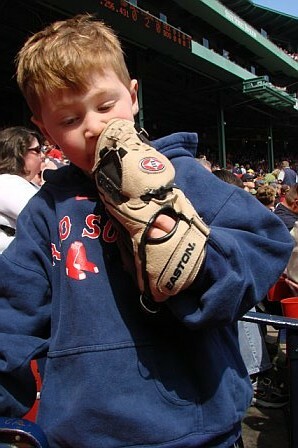 And in the fifth round, he picked his first non-Red Sox player: Torii Hunter. By the end of the draft, his team included Tim Wakefield, Johnny Damon, and of course, our favorite player of all time, Nomar Garciaparra (secured with his 24th, and final pick). Clearly, my son drafted a good team. 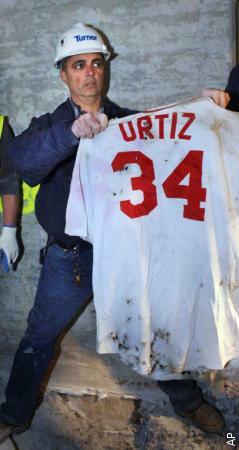 With Beckett, Ramirez, Papelbon, and Lowell anchoring his roster, he’s got as good a shot as anyone to win the league. 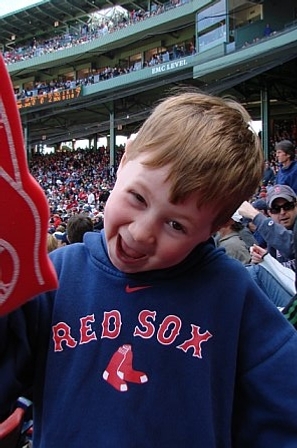 But I’ll always remember all the research he did, all the logical planning and rational reasoning his left brain performed, and how the loyalty and emotion of his right brain – the side that loves the Red Sox – swooped in at those moments of truth and buried his analytical, stat-focused left brain. He’s eight. 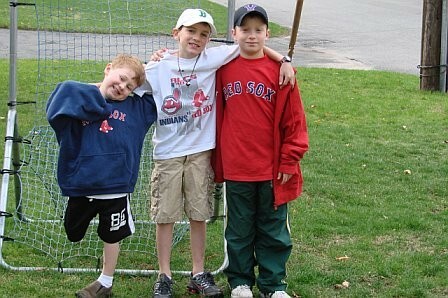 What a fantastic age to be a Red Sox fan!